This is Day 2 of our Washington, DC trip. For Day 1 check out this link. We met our son, Joe and daughter-in-law, Nicole in the lobby of our hotel, Kimpton Hotel Palomar, to grab a cup of coffee before we started Day 2 of our mini-vacation in Washington, DC. It was a gorgeous spring morning so we decided to walk to the Smithsonian National Museum of Natural History to check it out before heading to Nationals Park for a baseball game. We enjoyed the sights and sounds of the bustling city on our 40 minute walk. At one point we bumped into a mob of people all holding signs about global warming. One that I liked was "Global Warming So Uncool". Someone made a globe that was almost 3 foot in diameter and actually rotated on top of a long stick. I was pretty impressed with that one! We found out later that they were taking part in the People's Climate March. There were thousands of people involved and one of them was Leonardo DiCaprio. We might have walked passed him but didn't realize it! You never know what or who you might run into on the streets of DC. When we got to the museum we were happy to find a very short line. It only took us about 5 minutes to get in. The museum is free to get into, as are all the Smithsonian museums, making DC a very good choice for frugal vacationers. We saw everything from mummies to dinosaur bones and, not to be missed, the Hope Diamond. The 45 carat blue diamond was breathtaking. 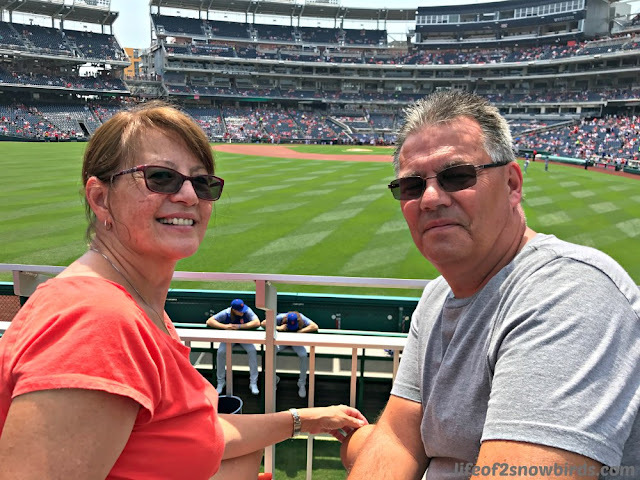 After spending a couple of hours at the museum, it was time to head to Nationals Park to watch the Mets play the Washington Nationals. The stadium was not within walking distance so we headed to the train station. We found that once we got the hang of how to use the Metrorail it was a much more convenient way to get around DC than driving. 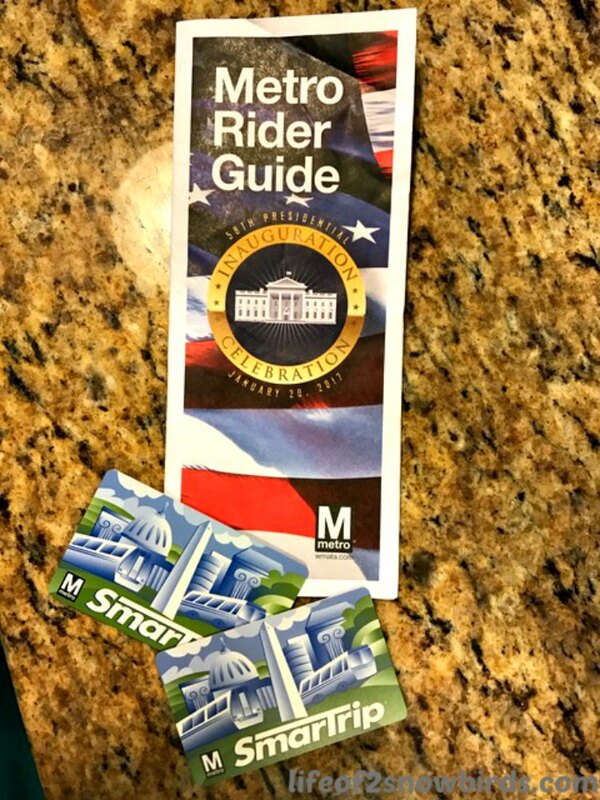 The first thing we had to get was the SmarTrip card which you can buy at the vending machines at every train station. The cost is $2.00 per card but has no monetary value until you load value onto it. Also, as long as we take care of them and not lose them we can use these card the next time we visit to DC. After purchasing our cards, we checked the map above the vending machine to find the stop for the stadium. Once we found it we saw that it would cost us $2.15 to get there. We put $8.00 on each of our cards so that we had enough to get us back to the hotel and we thought we might use the Metro to get to our dinner reservation. The magnetic back of the card activates the turnstile at the entrance to the subway station. You are eligible for a discounted Smartrip card and fares if you are a senior (65 or older) or if you have a disability. You can't buy these cards at the regular vending machines though. You can find a list of stations where you can purchase them by going to wmata.com. We made it to Nationals Park early enough to take a look around the stadium. It happened to be Pups in the Park day so there were a lot of cute puppies roaming around with their owners. And to our surprise, we also saw a lot of Mets fans! The 7 Line Army also happened to be there and we were very lucky to be sitting in the same section as them! 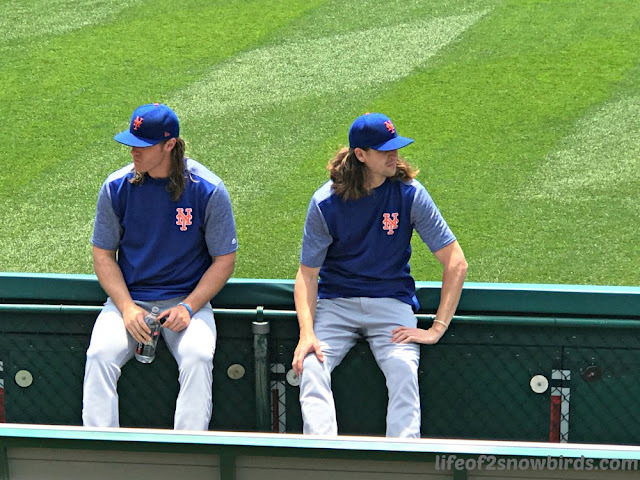 We always have a great time going to see the Mets at their opponent's stadiums but we have to quietly cheer them on so that we don't draw negative attention to ourselves but not this time. We had a great time cheering the Mets on with the 7 Line Army and many other Mets fans. I really started to feel bad for the handful of National's fans who were stuck in our section. I saw lots of eye rolling and heard the guy in back of us say to his friend "I wish they would all shut the... ". You can guess how that sentenced ended. We really had great seats too. We were in the first row right above the Mets bull pen. This was our view. And who is that right in front of us just hanging out sitting backwards on that bench? Just two of the most talented, and cutest, pitchers the Mets have right now! The Mets made our day by winning the game 5 - 3, adding to the great memories we'll have of our trip to DC. After the game, we headed back to the hotel to freshen up (and join the other hotel guests for wine hour!) before going to Chaplin's for dinner. We decided to do the 25 minute walk to the restaurant rather than taking the Metro. Joe made 6:30 reservations for us. Thank goodness he did because there were so many people waiting to get a table when we got there. 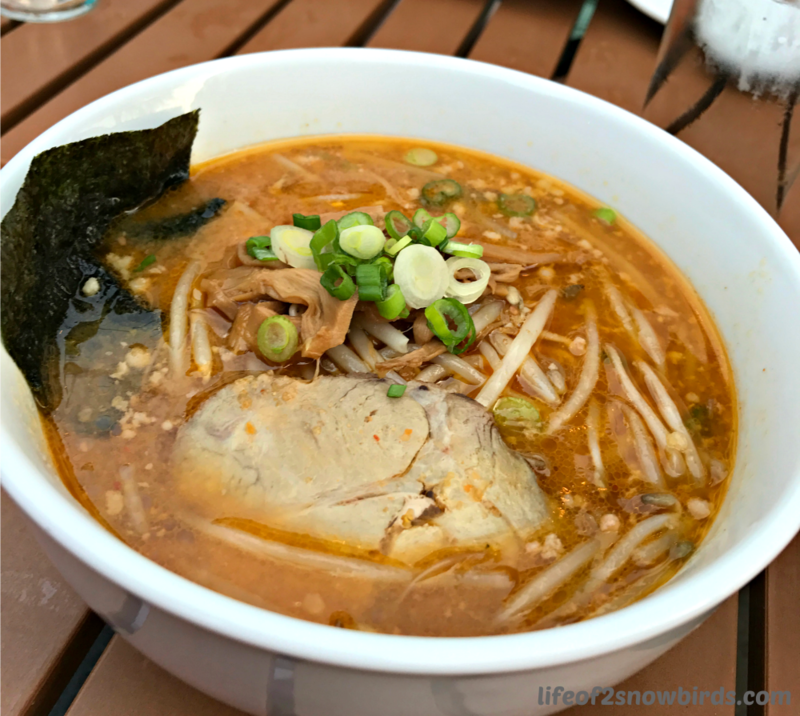 If you enjoy a good bowl of ramen, this is definitely the place to find it. 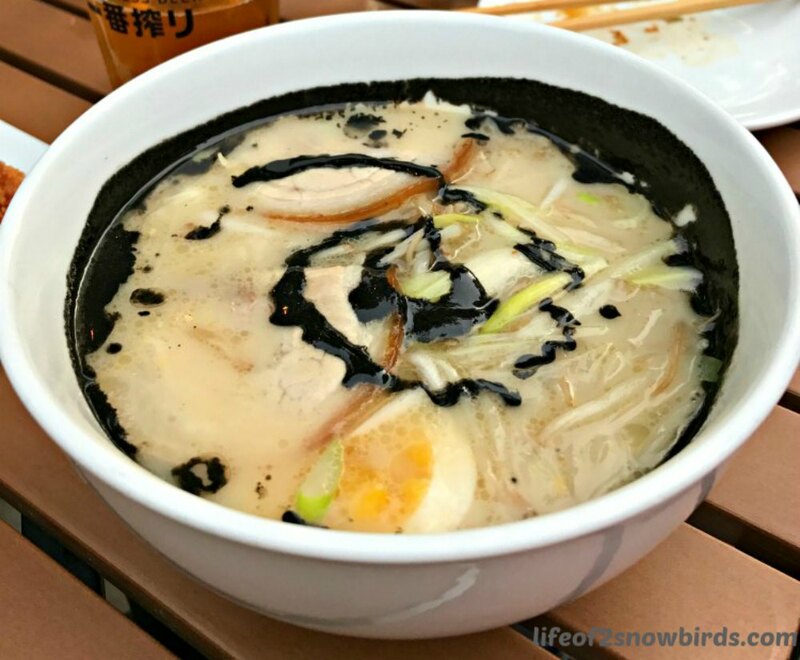 Chaplin's is a 1930's themed Japanese Restaurant and Cocktail Bar. Their decor is old Tokyo, Japan and they offer some 1930's classic cocktails. We tried their cocktails and also had the Japanese beer they served there. Then we ordered the gyoza appetizer, fried. They were so good! The entrees we chose were miso ramen for me, Soko got the Chaplins ramen, Joe got tori karaage, (Japanese fried chicken) and Nicole got the yakisoba (pan-fried noodles). No one had any complaints about their choices for sure. I would definitely go back if we were in the area again. We were stuffed after the great meal we just had so no dessert for us but I wanted coffee and Nicole wanted tea so we decided we would stop at the Starbucks down the block from our hotel. Joe and Nicole thought that we had walked enough for one day so called a Lyft to take us back. (I am just discovering the convenience and thriftiness of using Lyft as opposed to taxis and car services. I will get back to this in an upcoming post!) We brought the coffee up to our room and relaxed until it was time to call it a night. We had an amazing time, enjoyed great company and ate delicious food on our mini-vacation. I'm sure we will be back for more good times and to make more great memories in Washington, DC. The food was as good as it looks! Wow! That is quite the rock! Sounds like a wonderful day. 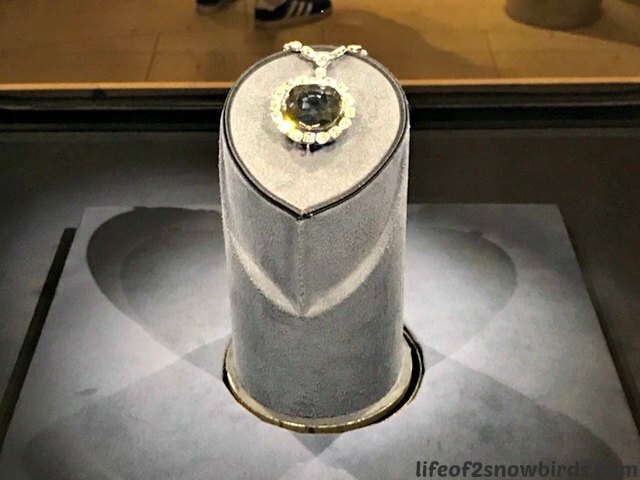 Wow, the Hope Diamond is beautiful! We've been to DC once and that was almost 40 years ago. I imagine lots has changed! Thank you for sharing these great pictures with us at Celebrate Your Story, and I hope you’re having a great weekend. Sounds fun! We are headed to D.C. next week. Can't wait!! It looks like it was a fun trip, with lots to do! Yes. There's too much to do to make one trip. This is our second time there and I know not our last! DC is such a fun city to visit! 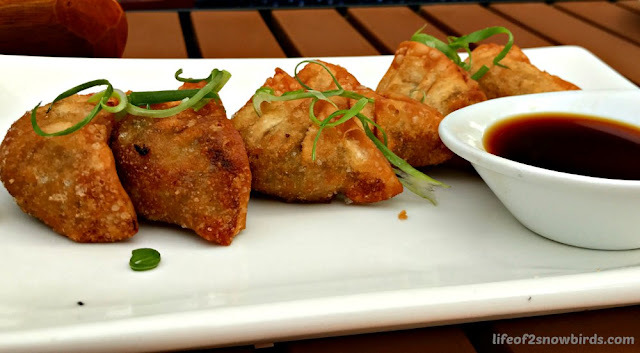 Thanks for sharing your adventures with us at Snickerdoodle. Looks like you had a great time at the game! I'm a die hard Braves fan and a fan of the game in general. Loved seeing the photos. Pinning to my travel board. I remember the rivalry the Mets and Braves had in the 80's haha! Thanks for having me at your party and for pinning! ...I just had breakfast and here your pictures of food are making my hungry already! I haven't been to DC in years, perhaps I need to done something about that. Thanks for stopping by Tuesday's Treasures. I hope that you can find your way back again. Thank you for having me! Just found your party and I am so glad I did. There are so many terrific travel posts to read! Hello, I am not too far from DC. The Orioles are my team to support. I love visiting the museums in DC. The food looks delicious. Looks like a fun trip and great photos. Happy Tuesday, enjoy your day! Thanks for your comments! You are so fortunate to have DC that close to you! Looks like an awesome vacation. I used to go up to DC for weekend vacations when I lived in Raleigh NC. It's farther now, but I think I need to make another trip. Hope you get to make another trip soon! Thank you for your thoughts! The Smithsonian museums are so much fun. I hope you will get a chance to go one day. Thank you for have such a wonderful party! Those photographs were amazing and so much fun to look at. Thank you for have such a great party! You can be sure never to run out of things to do in DC all year round! Looks like you had a great time! I am in awe of the Hope Diamond! I need to see that too. See you at Fly Away Friday this week! We had a wonderful time. DC is someplace we will return to for sure. Thank you for hosting such a great party! 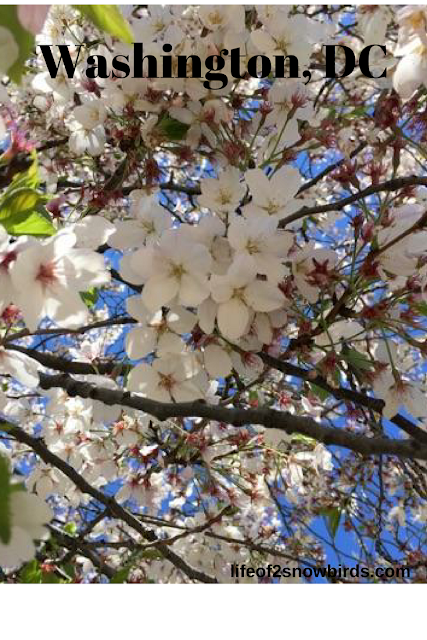 I have always wanted to see the cherry blossoms on the Mall. DC is amazing, my favorite museum is the Hirschorn and the Air & Space Museum. Thanks for sharing with #FarawayFiles, looks like a fun roadtrip! Beautiful! I haven't been to the Hirschorn Museum before. Yay! I have an excuse to go back! Thank you for having me at your party! I hope you get a chance to visit DC one day!